Jorge loves spending time with the mission volunteers. Jorge was born in 2009 and came to Mustard Seed Communities in 2011. He is asthmatic and has cerebral palsy, epilepsy, and psychomotor delays. Jorge has improved significantly with physical therapy and loving care over the last few years. He is currently working on his head control and neck strength and will continue to work towards his goals of being able to sit independently and to stand with only the support of a person. Jorge smiles whenever people are close by to talk to him and prefers not to sit alone. He also enjoys listening to music. 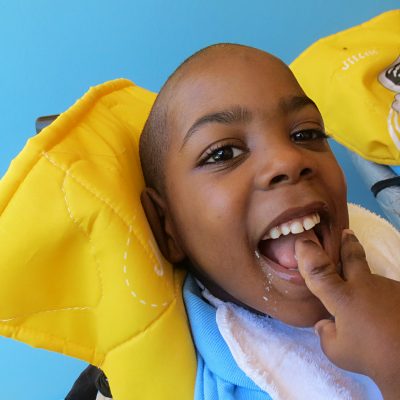 Thanks to the attention and loving care he has received at Hogar Immanuel his health is stable.